6	Landscape on the cusp: Hilary Chapman on the lithographs of Michael Honnor. 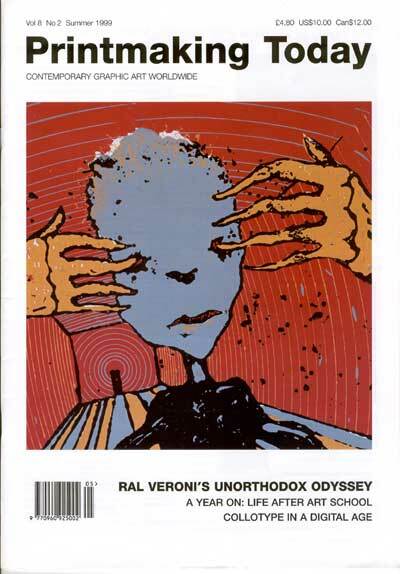 10	Ral Veroni: an unorthodox odyssey. Linda Neilson reports. 12	Cities as Babel Towers. Brendan Hansbro by Pryle Behrman. 8	Argentinian printmakers are prolific, proactive and diverse. Alfredo Benavidez Bedoya reports. 29 A question of terminology. Pauline Muir and Laurel Mckenzie on the limits of non-toxic printmaking. 15 Breaking the boundaries. Norma Silverton and Marilyn Simler on pushing print into sculpture. 30 Collotype in a digital age: the latest research by Paul Thirkell. 4	STOP PRESS: the latest on a new US Print Society, the founding of an Italian print collection and the UK Pnntmakers’ Council Biennale. 21	LISTINGS: four pages of print exhibitions, previews, artists’ residencies, conferences and opportunities. 32	BOOK REVIEWS: Pop Art’s not dead... new publications on Patrick Caulfield and Richard Hamilton, plus - how exhaustive are two new books on wood engraved. 18 A year on. Three printmaking illustration and fine art papers? graduates on life after art school. 20	Future signs: Jim Anderson on a 33 COMMENT: letters from readers. show of student talent in London. 28	Print dynamics. The University of the West of England is an education success story writes Rosemary Simmons. 16	Drawing from life. Julia Midgley on a hospital residency. 17	A brush with death. The effect of illness on Stephen Mumberson. 34	Portrait of my mother and me. Hilary Owers on a woman’s place. 26	Hidden gems in Wales. Robert Meyrick on a valuable print resource.